Biting is the most common problem for which dogs are presented to veterinary behaviorists. Dog bites are a dangerous risk faced by veterinarians, their staff, and owners every day. Veterinarians play an important role in their own safety, the safety of their staff and clients, and the welfare of the dogs presented for care. However, while the risk of dog bites is high in veterinary practice, it is often dismissed as an expected aspect of the job. When implementing safety measures, these measures not only include the veterinarian and veterinary staff, but also the owner and other clients and patients in the clinic and its surrounding facilities, such as the parking lot. Preventing injuries can only happen if the causes and contexts of biting are considered. By nature of clinical practice, we restrain, palpate, poke, and perform procedures that trigger fear and sometimes pain in our patients. Escape is impossible, so biting becomes a practical defense for some animals. Understanding the simple premise that most bites are defensive and delivered by fearful dogs can significantly reduce the risk of someone being bitten. Dogs that have been in a veterinary setting previously may have developed fear from the experience. Classical conditioning (think of Pavlov and his bell) often occurs; white coats, the smell of disinfectant, stethoscopes, and other innocuous stimuli become aversive or predict the possibility of an aversive event. In many veterinary hospitals, the examination room is often a small space with only 1 access door. In addition, typically the dog and owner are the first to enter and wait. Defensiveness and anxiety can occur when the pet feels that there is no escape. Adding to the dog’s apprehension are the actions of the owner and staff. The owner’s tightening of the lead (another classically conditioned trigger of fear) and the staff’s well-intentioned approach to “say hello” may result in fear instead of reassurance. The risk of injury extends to anyone near the dog when it is frightened or ill. The owner may be most vulnerable and redirected aggression can surprise the owner who is usually trying to pet, talk to, or otherwise reassure the pet. For this reason, always ensure that the owner is a safe distance from the dog even if the dog is muzzled before any procedures are performed. Agitation, and perhaps disinhibition of aggressive behavior, may occur with sedation.3 This may become problematic when a sedative (eg, benzodiazepine) is administered to historically fearful dogs. Even a docile animal may bite the owner while under the effects of these medications. This creates a potential problem when owners and staff have access to the patient after administration of pre-anesthetic medication or during recovery from a procedure. For this reason, premature discharge of still-sedated animals can be dangerous, even if aggression has not been noted in the past. Fear or anxiety (these may or may not be the same) can often be inferred from the dog’s attitude and body language. Signs preceding aggression include trembling, lowered body posture, growling, and baring of teeth. Averting eye contact or staring directly at the clinician. Signs of an impending bite can be subtle or even undetectable; therefore, every effort should be made to anticipate and prevent bites. Entering, sitting in, or exiting a waiting area can trigger arousal and barking in dogs. To avoid this chaos, consider a separate entry area, such as a back door, for fearful or reactive dogs. Encourage owners to inform staff if the owner feels the dog is overly reactive, and have staff identify this information in the medical record. At the time of the appointment, owners can leave the dog in the car (as long as the weather is not too hot or cold) while registering; the dog then can be escorted to the separate waiting area (or directly into the examination room). Alternately, identified animals can either be the first or the last appointment slots of the day, which may allow for a quieter environment. As discussed previously, most examination rooms present a double entrapment for the nervous patient: the leash and a small space with no escape access. It is no surprise, therefore, that many dogs will become “defensively aggressive” to the approaching veterinarian or technician. Allow the dog to be the last to enter. The veterinarian or staff can collect the dog and owner from the waiting area and walk into the room together. Alternatively, if the client has already been shown to the examination room, he or she can simply be asked to step out with the dog, allowing the staff to enter and then return with the dog. Regardless of the sequence, these strategies should help avoid any arousal associated with the veterinarian’s or technician’s entry. Our instinct as veterinary caregivers is to reassure dogs by approaching and inviting them to sniff a hand and then perhaps petting them. Contrary to what many believe, however, dogs are not necessarily reassured by this type of interaction.4 In fact, such an approach (direct eye contact, bending over, and reaching out) is likely to be perceived as a threat. Give the dog some time to make up its own mind about interacting. Many dogs will approach on their own. If not, however, it might be best to respect the dog’s space-at least until the time comes for the physical examination. Fearful dogs are more likely to relax when the veterinarian or technician maintains a respectable distance and avoids unpredictable movements in the examination room. The well-maintained path to a dog’s brain is often through his stomach. You can use this to your advantage by counter-conditioning by using food (something “good”) to counteract the anxiety of the examination. Owners can be asked to bring a favorite treat to each examination or the clinic can stock foods in each room. Food should be provided in very small pieces and should be highly palatable. Examples include “squeeze cheese,” peanut butter, freeze-dried chicken or liver, or soft treats. Food should be used liberally during the visit from the beginning, throughout the examination, and at the end. For example, it can be gently tossed to the dog while the clinician/staff and owner are reviewing the history and can be offered freely during restraint and examination. Food is also indispensible when a muzzle is used (see To Muzzle or Not to Muzzle?). Instead of approaching the owner and dog, ask the owner to bring the dog to the center of the room. Approach the dog’s side instead of the dog’s face. Much of the physical examination-even a cranial nerve examination-can be conducted from the side or facing the same direction as the dog. Remember, if approaching from the back or side, someone should be holding or controlling the dog. Whether or not to use a muzzle is a judgment call that must be made by the clinician and staff member. It is often a matter of determining whether the patient is better with or without secure restraint or muzzling. To minimize uncertainty, clinic policy can indicate use of a muzzle in any patient with a history of biting. If a muzzle is used, the type of muzzle used and how it is applied is extremely important. Tying the face with gauze or using a tight nylon muzzle may increase anxiety and fear. The best muzzle to use in terms of minimizing anxiety and fear is a basket-type muzzle. Muzzling early in the examination process can be less stressful because the examination can proceed with efficiency, calmness, and less restraint than might otherwise be needed. An experienced technician can place the muzzle with food and patience, preferably from the side and with soft food already placed inside it. Basket muzzles allow the dog to be fed during the procedure and also allow the owner to be nearby (perhaps helping feed the dog). When appropriate and safe, technicians can teach clients how to train their dogs at home to wear basket muzzles using food rewards. Previous history of aggression, which is most important. Together this collection of information will provide more information than a simple caution sticker, and can help subsequent visits go more smoothly and safely. Behavioral records also help clients realize that you see their dogs as individuals with fears, likes, and dislikes that can be accommodated while still providing good health care. Read Body Language. Pay attention to the dog’s body language for signs that it may be fearful, anxious, or ready to bite. Adjust Entry/Exit and Schedules. For dogs that may be potentially fearful or reactive, provide separate waiting and/or entry areas or schedule them for the first or last appointments of the day. Let the Dog Be Last. Allow the dog and owner to be the last individuals to enter the examination room. Postpone Greeting the Patient. Do not rush to greet the patient; instead, give the dog some time to decide about interacting and respect the dog’s space until the physical examination. Approach Sideways. Have the owner bring the dog to the center of the room and approach the dog from the side instead of the front. Feed Tidbits. Use food liberally throughout the visit to create a positive experience for the dog. Make Use of Muzzles. Use a basket-style muzzle on any dog with a history of biting. Write it All Down. Keep a medical record for each patient that includes a behavior score as well as specific information about the dog’s behavior. Protect the Client. Educate the client about safely medicating the dog at home or have the client board or bring the dog to the clinic for medication administration. Keep Patients Happy. Make every effort to ensure that the dog’s visit to the clinic is as positive as possible; allow the pet to learn that visits include delicious food, consistent routine, and gentle handling. When a client presents a dog specifically for biting, management of the problem requires either treatment or referral to a specialist. Attention to safety is central to treatment of the aggression. However, when a pet owner presents a fearful or anxious dog for an annual examination or unrelated complaint, the owner’s safety needs might be less clear. While avoiding bites is clearly important while in the clinic, it is equally important to give the owner advice, when needed, about safety at home. Arousal should be avoided as much as possible by providing a separate entry and waiting area for anxious/aggressive dogs. The owner should not be permitted to restrain or assist with procedures, or even stand too close to his or her pet, unless the dog is muzzled and primary restraint is accomplished by the technician. If the client is expected to administer oral or topical medication at home, they must be given specific instructions about how to do so without being bitten. When needed, clients should be given information about acquiring a safe, basket-style muzzle. The client should also be shown how to introduce a muzzle to his or her dog, using positive associations, such as food, when using the muzzle. Clients should be reminded not to corner or “trap” the dog for any procedure. It might be necessary for dogs with any history of aggression to be boarded during the treatment period or brought back to the clinic for treatment visits, allowing a staff member to administer medication. All patients, including those with fear, anxiety, and/or aggression, require gentle and careful handling. Once the dog is aroused, its ability to learn something new is diminished. Veterinary staff should strive to use handling procedures that emphasize calm, benign control while allowing the animal to make choices. For examples, the staff should be encouraged to attend seminars and continuing education on techniques for gentle handling within the veterinary setting. Teaching dogs that a veterinary clinic is filled with calm, nonthreatening staff who offer delicious food, consistency in routine, and patience will help reduce stress for everyone involved: the dog’s owner, the veterinary staff, and the patient whose welfare is everyone’s goal. Wang X, Ding S, Li Z, et al. Human rabies epidemiology in Shandong province, China. Japanese J Infect Dis 2010; 63:323-326. Reisner I. 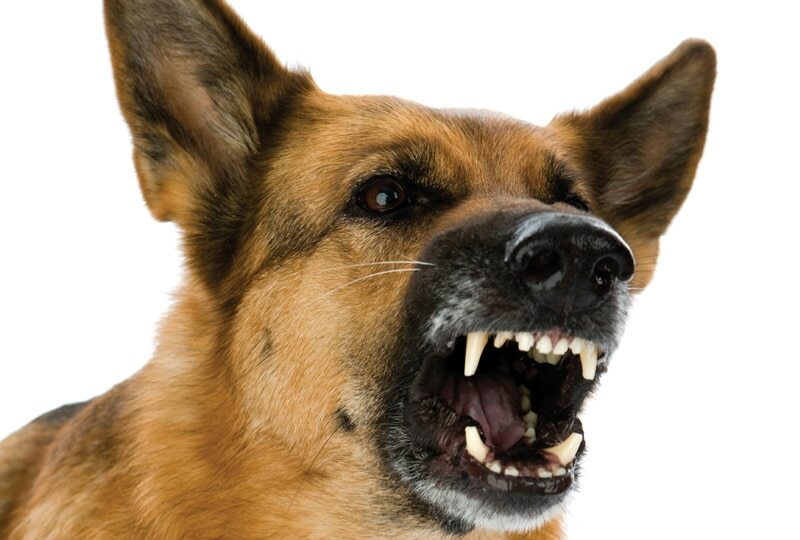 Differential diagnosis and management of human-directed aggression in dogs. Vet Clin North Am Small Anim Pract 2003; 33(2):303-320. Crowell-Davis SL, Murray T. Benzodiazepines. In Crowell-Davis SL, Murray T (eds): Veterinary Psycho-pharmacology. Ames, Iowa: Blackwell Publishing, 2006, pp 34-71. Haug LI. Canine aggression toward unfamiliar people and dogs. Vet Clin North Am Small Anim Pract 2008; 38(5):1023-1041.